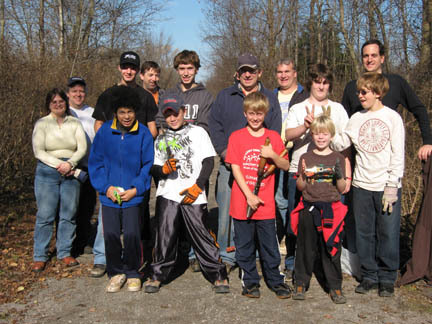 Our trail needs constant maintenance, but to make it more fun, we schedule volunteer maintenance days twice a year to keep the Lehigh Valley Trail and Trail Garden in shape. At the Trail Parking Lot at East Henrietta Road just north of Rush-Henrietta Townline Road. Pets, unsafe equipment, motorized vehicles (tractors/ATVs). Caution: There is a significant chance you will encounter poison ivy, bees’ nests, and other insects while clearing the trail. Please dress accordingly and come equipped with any remedies you may need. For more information about helping on the trail or garden contact Trail Manager Gene Gillan. If you can’t come on Clean-Up Day but would like to help on other days or in other ways, please visit the Volunteer page. We can always use help throughout the year.